For many anglers, winter means a time to hunt deer and re-organize fishing tackle. For others, it’s a time to test their mettle against wintering largemouth as water temps drop. Many anglers associate that time period with ultra-finesse techniques. For Bassmaster Elite pro, Mark Menendez, he looks forward to picking off key areas with a crankbait. Menendez admits that he could be fishing 36-degree water with a float’n’fly, jig, or a spoon, but he finds it all rather boring. Instead, Menendez enjoys the challenge of finding the right crankbait to get the job done. “When the water is really cold, the crankbait doesn’t have to have a lot of action to look really attractive to a bass, they just have to be able to see it,” he said. During the cold-water months, some body styles work better than others. When water temps range between 36- and 41-degrees, a thin-bodied crankbait with a tight wiggle, like a Strike King Lucky Shad, work best. Menendez uses some of his older Lew's spinning reels with a 5:1 gear ratio as he’s careful not to “over-crank” the bait. When the water is cold, fish are much more lethargic and won’t always chase down a fast-moving bait. Water temps ranging between 41- and 45-degrees mean that Menendez will targets broken rock banks and rip rap in the 6- to 8-foot range with a Strike King Series 3 Crankbait. Menendez stresses that anglers continually maintain contact with the bottom- and not to worry as the Series 3 has great deflection qualities. As the end of winter nears and spring approaches, rains will dirty the water and temperatures will rise. Water temperatures will range from 45- to 49-degrees and water that was once clear will become slightly stained to stained. In Tennessee, this usually takes place in mid-February. He’ll target 6- to 12-feet of water with a Strike King Silent Stalker Series 4 crankbait. Because the bill comes out if the bait at a slight angle, “it increases the width of the action of the bait”. Warm water temps mean that he can fish his crankbait faster to produce a wider wobble and more vibration. In turn, the crankbait will be more easily found since it pushes more water and is a bigger target. In cold water, the Red-Eye Shad is a key player in these temperature ranges due to its tight action, vibration, and variety of rattles. At 51 degrees, a bass's metabolism is moving fast enough to chase a moving lure- like the Strike King Red-Eye Shad. He’ll fish a ½-ounce Red-Eye Shad model on 12- to 15-pound Seaguar InVizX fishing line on a 7' medium-heavy action Lews Custom Speed Stick fishing rod and a Team Lew's Lite Baitcast Reel. Strike King Red Eye Shad Crankbaits - 1/2 oz. "In areas with vegetation, this maybe the absolute best presentation! ", Menendez said. Allowing the bait to fall into the vegetation, then ripping the lure free will create a reaction strike. By finding a clear spot in the grass, like a sandy or rocky spot, the bass will congregate in numbers in these places. 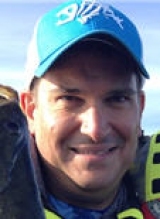 Menendez uses 30-pound Seaguar Kanzen braided fishing line for the technique. The "no stretch" properties of braid allow him to keep the bait clean of grass when he rips the bait. On lakes with big bass, like Guntersville, Sam Rayburn, and Okeechobee, he’ll fish the larger ¾-ounce Red-Eye Shad model for a larger profile. “I love the "Two Tap" deep sound in the vegetation. I will use the rattling version more in open water,” he said. He prefers red-patterned baits like Chili Craw, Green Tomato, and Rayburn Red in cold murky water. Chrome/blue will take a front seat with clean water and high skies. He’ll keep the hooks same size to keep the bait balanced and running true. “This is a technique you are going to catch a lot of quality fish with,” Menendez said. The bite will be spongy at times. Under pre-front and overcast days, be sure to have a good grip on your rod, otherwise they’ll be sure to rip it out of your hands. Menendez favors a really soft-action Lew's Drop shot rod for fishing the Lucky Shad to prevent him from feeling the fish and pulling the bait away from it. After all, cold water fish don’t pull hard so a powerful rod really isn’t the best tool for the job. He’ll pair the rod with a Lew's Spinning reel spooled with 6- and 8-pound Seaguar Invizx fluorocarbon fishing line. When throwing all other crankbaits, he’ll opt for the Lew's 6’6 David Fritz Cranking bait cast fishing rod that allows him to cast accurately. He’ll pair it with a Lew's BB1 fishing reel spooled with 8- to 10-pound Seaguar Invizx fishing line .